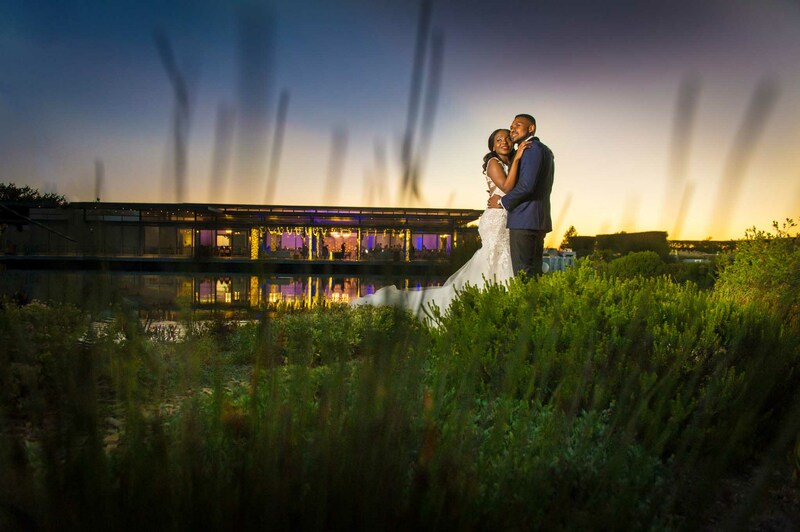 The beautiful couple, Boikanyo and Suleman, shared their special day on the exquisite Cavalli Wine Estate, surrounding everyone by breathtaking views and a charming atmosphere. The bridal party were eager to help the beautiful bride get ready on Spier Wine Estate. The rich mustard tones of the bridesmaids Silk organza dresses, made an alluring contrast against the chocolate browns of the wooden furniture and Boikanyos’ elegant white gown which made it an absolute treat to capture their Cavalli wedding Photography. The mustard dresses also complimented the Brides favourite flower, the sunflower, which was seen throughout the evening. 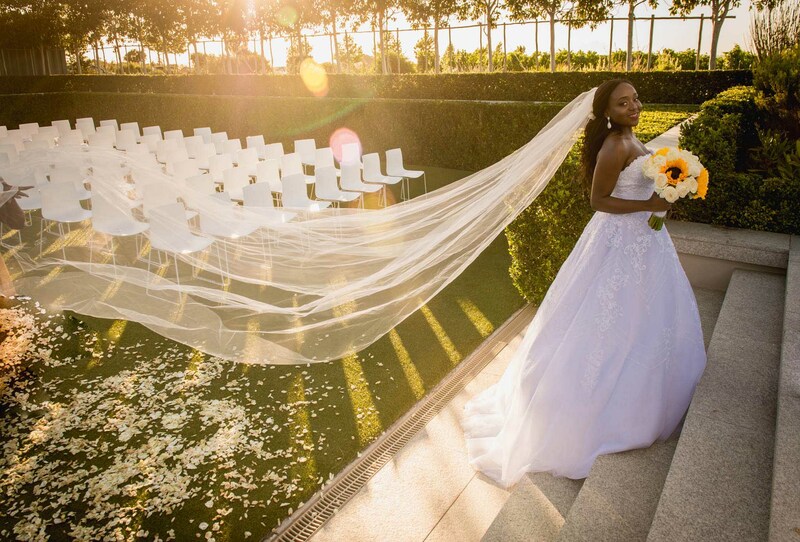 Boikanyo, portrayed a women of absolute content and bliss in her Anna Georgina Bridal gown, as her friends buzzed excitedly around her like champagne bubbles in a glass. The men also conveyed so much excitement as they helped Suleman get ready for one of the biggest days of his life. So exciting! For the ceremony, all the guests waited in anticipation in Cavallis’ spectacular sunken garden for the beautiful bride to make her appearance. The atmosphere in the garden had a cheerful buzz filled to the brim with excitement and emotions. The Bride finally came into view, looking like she had just stepped out of a Bridal catalogue, taking every guests’ breath away and stealing Sulemans’ heart even further. What a perfect moment! The bridesmaids came first looking as stunning as ever stepping into the sunken garden and gliding their way down the aisle. Next came the Bride, both with her mother and farther on either side, as they walked her towards the man of her dreams creating a moment that was a privilege to capture for the Cavalli wedding photography. The couple stood illuminated by each others love under the gazebo surrounded by all their loved ones as they said their I do’s. After the newlywed couple got showered by rose petals and adoring friends and family the guests made their way to the pre drinks area in another exquisite part of Cavallies’ gardens. While the guests mingled happily over mouthwatering snacks and cool, crisp glasses of champagne, the couple made their way around to say their hellos. The perfect opportunity to capture everyone together with a phenomenal setting and landscape, framing the buzz of excitement, perfect for the Cavalli wedding photography. The reception hall was magical and looked like something out of a dream with the hanging floral arrangements from the ceiling and pops of bright yellow sunflowers contrasted beautifully against the pure elegant whites of the chairs and tables and crystal glassware, stopping every guest with admiration as they entered the hall. The excited guests filled the hall and were soon seated and applauding the entrance of the bridal party and groomsmen as they danced into the hall. The newlywed couple made their grand appearnce once the bridal party and groomsmen competed their superbly choreographed dance. The bride in another dress, as beautiful as the last, also an Anna Georgina dress. The night was filled with touching speeches and toasts pulling on everyones heartstrings and ending off with everyone on their feet and dancing into the night which looked amazing in the Cavalli wedding photography. The rest of the night was danced away by beautiful people wrapped in the warm feeling of love and romance. We wish Boikanyo and Suleman all the happiness in the world and hope our paths cross again in the Future! What an honour to be able to be part of such as special day!